Experience the lifestyle of retiring in the heart of Glenelg in a High Tea at our premium location just a stroll away from Jetty Road. 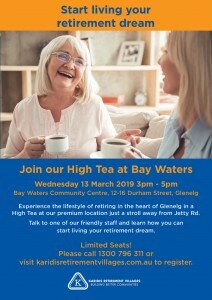 Join our High Tea at Bay Waters! Experience the lifestyle of retiring in the heart of Glenelg in a High Tea at our premium location just a stroll away from Jetty Rd. Talk to one of our friendly staff and learn how you can start living your retirement dream.